Full court press defenses try to get turnovers and easy baskets by pressuring, trapping, and harassing the offense. 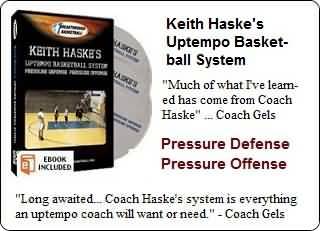 Here are several principles and some strategies in beating this pressure. Stay calm. The press tries to upset you... try to be calm and confident that you can beat it. If you make a mistake, you must immediately forget it and stay calm. Otherwise, it can have a snowball effect. Do not dwell on what's already happened, always think "next play", what is going to happen next. The coach must stay calm too. An upset, angry coach is not what the already rattled players need. In a time-out, the coach must be calm, reassure, re-focus his players, and settle his players down. Think "attack!" A full court press is always a gamble for the defense. If you think positive, and attack the pressure, you can get an easy lay-up and score. Attack with quick passing as this can get you a 2-on-1 situation and a lay-up. Sometimes you have to beat the press with the dribble, but then you are less likely to get the lay-up. So think pass first. Getting the ball in-bounds. Get the ball in quickly, before the defense can get set. 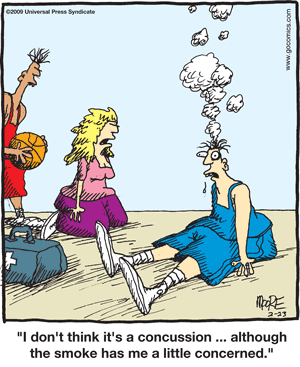 Do not take the ball out from directly under your basket, or your passing lane may be restricted by the backboard. If the other team has just scored, you may "run the baseline". You cannot run the baseline if the ball went out of bounds and the official is handing it to you. You can run the baseline after a time-out, if the time-out was called immediately after the opponent scored. The point guard must get open. Too often I see young point guards trying to get open by running away from the defender. Instead, your point guard should walk up to the defender, make contact with the defender (get a forearm into the defender) and then "bounce-off" off the defender to get open. If the point guard is being aggressively denied, he/she can walk the defender down almost to the baseline, seal and quickly release long for the over-the-top lob pass. When receiving the inbounds pass, we teach our receiver to get into "triple-threat position" after receiving the pass, rather than just putting the head down and starting to dribble. Getting into triple-threat allows the receiver the "three looks" disussed above, to see the defense, see receivers, and still have the dribble option. Avoid "trap areas"... the corners. Don't dribble into the corners, especially on either side of the half-court line... back away but keep your dribble alive, or pass off. If you have your dribble, you can (1) attack the outside leg of one of the defenders and dribble by, or (2) split the double-team by making an aggressive "step-thru" with one leg between the defenders, with head and shoulders bent over forward, cradling and protecting the ball like a football halfback going through the line, and then push the ball out in front of you starting your dribble. Quick, accurate passing. Make quick, accurate passes. Avoid soft, lob passes. Passing up the floor, and cutting, are the secrets to beating the press. Look up the floor and anticipate where you will pass the ball, even before you get it. 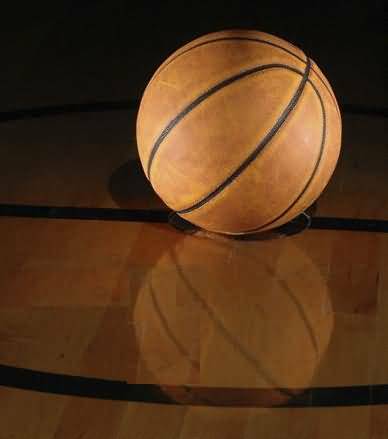 Don't be hesitant to make the long pass up the court. Oftentimes a good point guard can attack the press with the dribble and, before the double-team arrives, make a long pass up the court to an open receiver for a lay-up. Receivers get open and meet the pass. But keep your spacing. Look for the open spots in the defense. Get open so your teammate can pass to you. Before you even get the ball, know where your other teammates are. When you receive the ball, immediately pivot and face down-court, so you can find an open teammate. Use the whole court and reverse the ball to the opposite side. Keep one player behind the ball on the weakside to reverse the ball to the opposite side of the court. Have a standard "press break" offense that works for you. See 80-60-40 press breakers. Sean Miller: Beating Pressure Defenses with Sean Miller, University of Arizona Head Coach; 2011 Pac-10 John R. Wooden Coach of the Year. PAC-10 Coach of the Year Sean Miller covers everything you need to know to put even the best defenses on their heels! Combining footage from two clinics, Miller arms you and your players with aggressive methods for attacking pressure defenses.